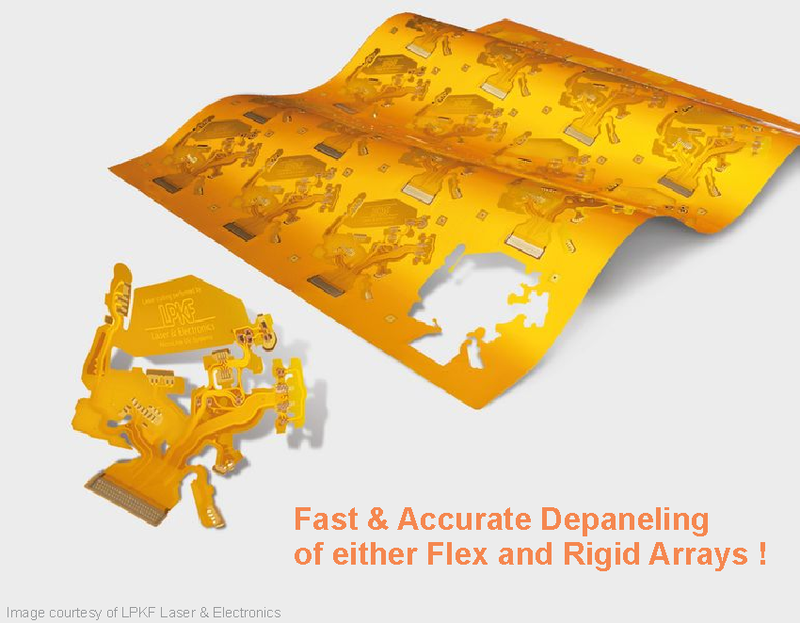 Beam On Technology offers UV laser depaneling services for both flex circuit and rigid PCB assemblies. One of the key benefits of UV laser routing is eliminating the need for costly NRE tooling for single sided boards. For double sided boards, a simple and inexpensive plate without cumbersome screwdowns and holding clamps is more than sufficient. UV lasers cut with relatively low power and induce minimal heat stress and absolutely no mechanical stress. Our Microline 2820P is equipped with an integrated vision system and is able to align cuts accurately using global panel fiducials or when tight clearances are required, we can align using local board fiducials. A variety of fiducial options are available or we can use edge recognition for alignment. The Microline 2820P has a 15 watt laser source which can handle PCB thicknesses up to 1.6 mm cleanly and efficiently (63 mils). Thicker FR4 substrates can also be accommodated, but are often not considered cost effective compared to mechanical routing. The laser process is completely software-controlled using CircuitCAM enabling The Microline 2820P to ablate complex geometries and contours very precisely without limit to gap spacing and Corner radius. Power output, beam frequency, and speed, are programmable so the 2820P can ablate a wide variety of materials such as Kapton, Peek, rubber, Grafoil and vinyl films.